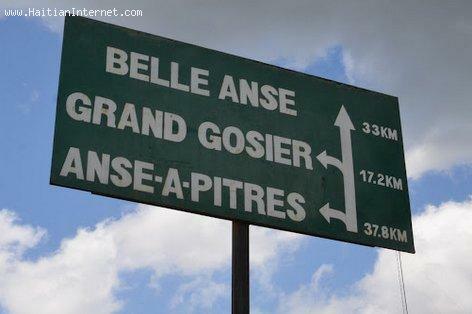 Here is a photo of the Haiti road sign for Belle Anse, Grand Gosier, Anse-a-Pitres. Belle-Anse and Grand Gosier are municipalities in the Belle-Anse Arrondissement, in the Sud-Est Department of Haiti. Anse-à-Pitres is a border town, also in the Belle-Anse Arrondissement. The border crossing from Anse-à-Pitres to Pedernales is one of the four chief land crossings from Haiti to the Dominican Republic.